With Mike Collett’s success in developing his airline flying career he is, understandably, less able to spend as much time at the club as he would like. Mike has been working with the committee on his succession plan. We therefore have great pleasure in announcing the appointment of Richard Crockett to the position of CFI effective 1st March 2013. Richard is known to you all as our staff instructor, a role to which he has brought tremendous levels of energy and enthusiasm. Obviously Mike will be a hard act to follow, but we know we can depend upon all Booker members to give Richard help and support as he settles into his new role. Please join us in congratulating Richard and offering Mike a huge vote of thanks for the immense contribution that he has made to the continued success of the club. Mike will be working with Richard during the month of February, to help him prepare for this increased responsibility. Plenty of members turned out today to take advantage of the sunshine and a flyable field. The new hard runway provided by The Management proved to be like a skating rink, so we flew off the unmarked snow. The views over a snow covered landscape were excellent. ﻿ ...and we flew until sunset. Meanwhile, back in the clubhouse it was wall to wall meetings. 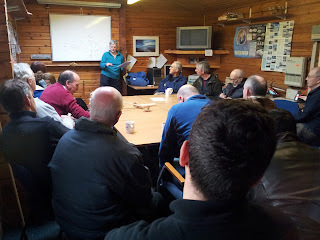 First up was Jim White and his cross country group, closely followed by the Bronze briefing on Navigation delivered by Steve Williams, standing room only. A break for lunch and then a session on Goal Setting led by Denis Campbell and Tim Scott, covering not only how to improve and progress in flying but also what we want to achieve as a club. Finally there was a briefing for those going on the summer expedition to Le Blanc. Next Saturday 2 Feb we have Sally Longstaff's Bronze briefing on Radio, and the Aerobatics course run as always by Graham Saw and Alun Jenkins. And of course as much flying as we can cram into the day. 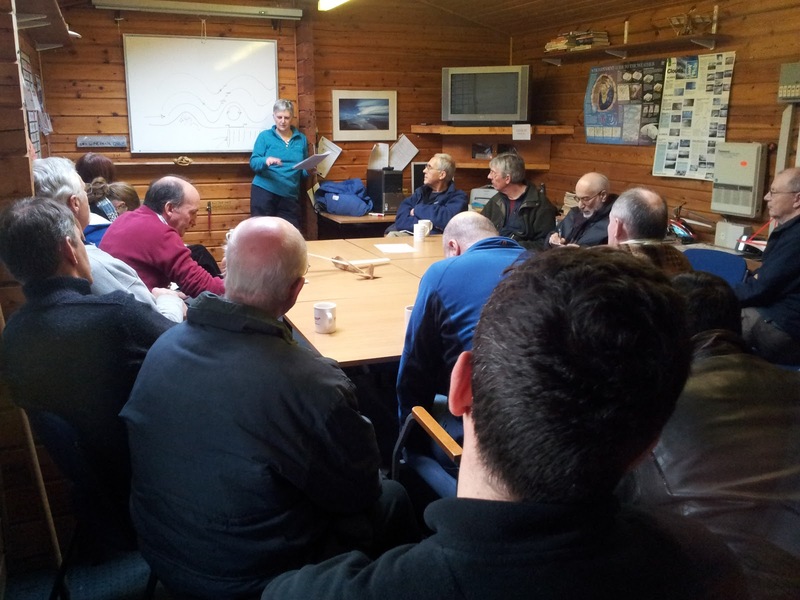 A creditable number of aspiring Bronze pilots and others braved the snow this morning to learn about the perils of hypothermia as William Parker set out clearly the human factors which affect our ability to fly safely. We were joined by one of our friends from the Upward Bound Trust at Thame who was very impressed by our luxurious clubhouse. The session finished with a short quiz for all those present, which generated some lively discussion. Don't miss next week's briefing on Navigation by Steve Williams, 10am as usual. ﻿The airfield was very quiet under its blanket of snow. A few hardy souls braved the cold to enjoy the scenery from Mondays snow before the forecast heavy snow this weekend. We were joined by Airfield Manager David Philips who handled the controls for the whole flight (he last flew a glider on a course at Bicester in 1998) and threw in a loop for good measure. He commented that he hopes to find the time and do some more with us this season. Don't forget the Bronze C lecture on Human Factors this Saturday - 10:00 in the clubhouse. Many of you will have already thought about what you want to get out of your gliding in the coming season and beyond. But, have you set long, medium and short term goals and do you have a plan to achieve them? Gliding, like many sports, rewards effort. You get out of it what you put into it. 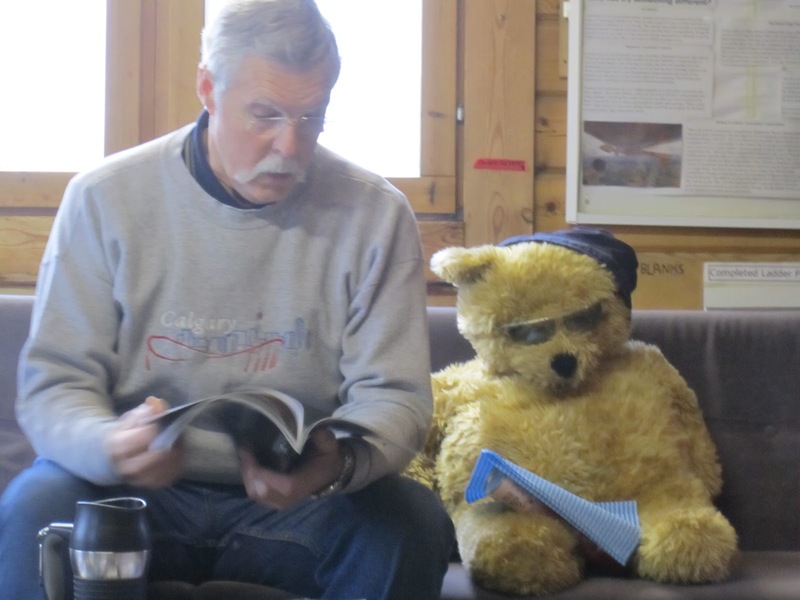 So, to help you get the most out of your gliding, we are planning a Goal Setting Workshop for all club members, whatever your stage of development. This will be in the clubhouse at 14.00 on Saturday the 26th January, for two hours. The session promises to be fun and will be facilitated by two of our members who have been National Champions and a members of the British team; Tim Scott and Denis Campbell. Thankfully, they each have a sense of humour too! Tim and Denis will talk about what it took to win. We will then workshop personal goal setting to help each of us be as good as we can be, whatever our goals; and of course, to help Booker Gliding Club sustain our reputation for developing safe, competent, winning glider pilots who really enjoy their flying. In contrast to yesterday, today there was hardly any wind and the air was silky smooth, a perfect day for training and sightseeing. The cloudscapes were amazing, with plenty for those who attended yesterday's briefing to practise their cloud identification skills on. This looked better in real life but you get the general idea. Later the sky cleared and it got a wee bit colder, and mist on the canopies put paid to play. We found Clarke Senior and Clarke Junior being very public spirited by the hangar. Paul very kindly gave a demonstration of the correct ratio of workers to supervisors. Aspiring Bronze pilots (and others), be sure to come along next Saturday for the next Bronze briefing, William Parker on Human Factors. A fantastic Bronze Lecture received by a packed audience this morning should ensure that at least eighteen people will be doing a great job of reading the weather from now on. I'm sure that some of the people in the audience already had a bronze, but it just goes to show the popularity of the Saturday morning lecture programme. Jane Moore comprehensively covered the bronze met syllabus with handy hints; how could anyone now forget the impact of the Umlaut on mountain winds. For many members the Bronze Lectures are an opportunity to meet new club members. 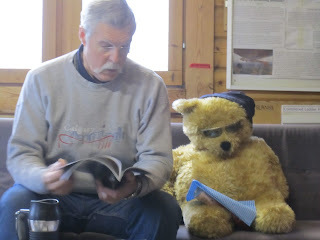 Ted makes a new friend whilst doing some last minute Meteorology revision. 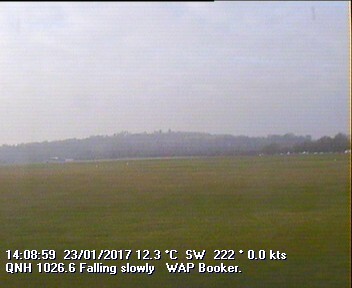 Activity has now transferred to the airfield where unexpectedly co-operative weather has allowed a start to flying operations. There was a good turnout this morning for the first of the Bronze briefings, when Symeon bravely tackled the subject of Theory of Flight, giving plenty of tips on how to pass the Bronze paper. Next Saturday's subject is Meteorology, ﻿the following week will be Human Factors, all welcome, pre-solo to pundit. By the time the briefing was over the sky had cleared sufficiently for a spot of aviation, and the dual tow was demonstrated when the K21 got stuck in the mud (in fact it required a bit of shoving as well). Just as cloudbase started to descend again, Deputy CFI Richard decided to have his first ever flight in the K18, which he pronounced to be a 'wonderful glider to fly'. 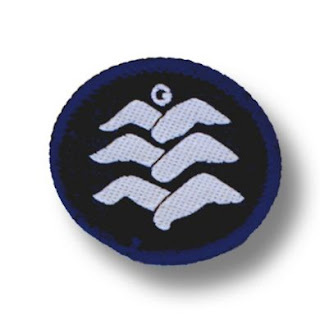 Working on your Bronze badge? Don't forget that the 2013 Bronze briefings start this Saturday at 10am in the clubhouse, with Symeon Economou on Principles of Flight. Details of the following briefings, same time same place, may be found on the calendar on the Members page of our website, see link on the right. All welcome, especially those intending to take the Bronze paper, but also anyone who wishes to brush up on their knowledge of gliding theory. The New Year started as we hope it means to go on, with plenty of sunshine. The airfield was closed so we took the opportunity to fly from the hard runway (parts of the field are currently more suited to mud wrestling). ...and a variety of flying activities. As well as members enjoying the views and practising aerobatics in the K21, the Falke did several sorties to explore the wave over the Oxford plain, and various models flew including this jet. ..and flying went on until the sun set.